These adorable centerpieces are perfect for every holiday party this season! These amazing cranberry flower centerpieces are so easy to do but absolutely so elegant. There are many variations of this simple concept depending on how you plan on utilizing this centerpiece. But lets start with the basics. 1. First you start by filling your vase with the cranberries, you want to leave two or three inches of clearance at the top of vase. You need to leave some extra room for the flowers and the water so the vase still looks elegant. 2. 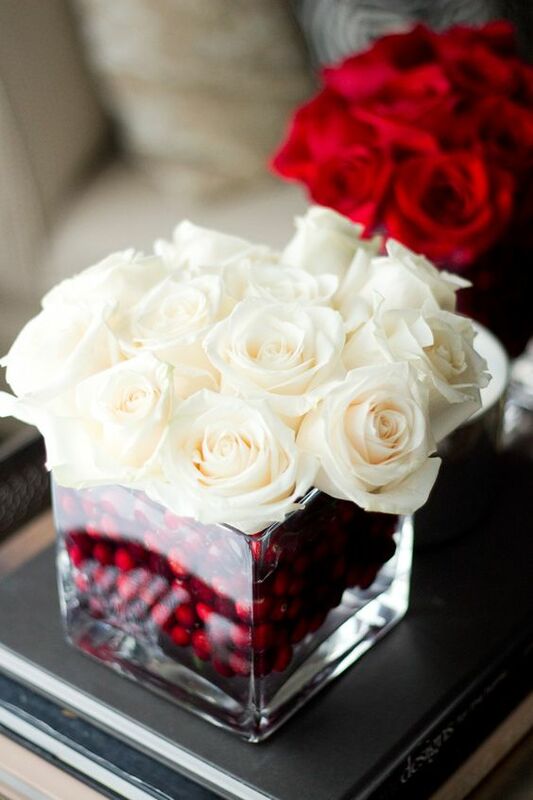 Once you have your cranberries how you want them, you can begin arranging the flowers. I suggest white flowers, particularly roses or peonies (even though they’re out of season) to contrast nicely with the red cranberries. 3. Ease the flower stems between the cranberries gently so you don’t break them. This is similar to arranging flowers between glass pebbles. 4. Once you have your flowers just how you want them, slowly pour cold water into the vase as to not disrupt your previous work. Stop pouring when the water line reaches the top of the cranberries but not so they begin to float. 5. In the end you should have a beautiful red and white centerpiece, you could even add some mint leaves for fragrance or some glitter branches for extra glam. This is a beautiful easy to do centerpiece that looks like it was professionally done without the big price tag. It can be done many ways, with tall long stem roses in a large vase, or in a short square vase for the table so you can see across the table. Make it your own this holiday season! Back to School with a new room!